The Droid Archmagus Trap is an Arcane type weapon. 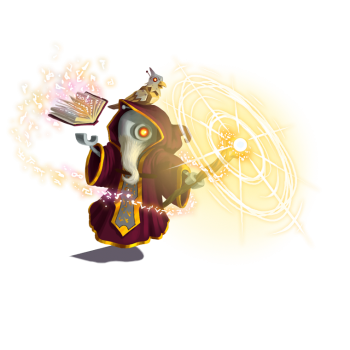 Powerful Arcane magics are extremely volatile to use and require hours of incantation to create, which is why this model is perfect for your magic conjuring needs! The Dumbledroid 9000 can easily utter hours worth of incantations in mere seconds with its gigaquads of memory which stores spellbooks upon codices upon grimoires upon tomes of magical knowledge. It will always be equipped with the right spell for the job! Incorporate the droid with an Animatronic Bird and capture Arcane mice with ease! Other than that small list of basically harmless side-effects, this trap is great! We promise! The Droid Archmagus Trap can be purchased for 4,700,000 gold, 1 Animatronic Bird, 50 Bloodstone and 50 Howlite from the Fort Rox Trapsmith. It cannot be refunded. 3 November 2016: The Droid Archmagus Trap was introduced. This page was last edited on 12 January 2019, at 11:28.